The yummy goodness of the pawliday season is almost here. And if you’re like most of us, you know it’s easy to pack on the pounds. But the good news is we have an easy way to keep the weight off and raise awareness for Tripawds Foundation too: The 2018 Walk or Run for Tripawds Foundation Virtual Race! Tripawds Foundation is hosting a 26.2 mile “Virtual Marathon” happening between Thanksgiving and New Year’s Eve, 2018. Don’t let the word “race” scare you: this fun event happens over 39 consecutive days! Just walk or run any time with the Tripawds Nation beginning on November 22, 2018 at 12:00AM EST, and you can help raise awareness and encourage people to donate to Tripawds Foundation. Our “marathon” takes place over 39 days. 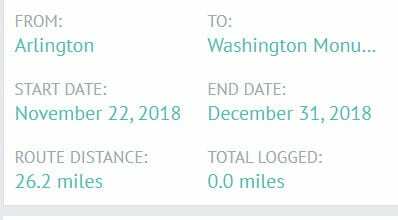 Each time you walk and share your mileage online with the Racery app or website, you help spread awareness and encourage holiday season donations to Tripawds Foundation. Our friends at Racery made us a course that takes us from Arlington, Virginia to the Washington Monument. After all, what better place to raise Tripawds Community awareness than the U.S. capitol? The virtual course you will walk or run. Walk or run in your own neighborhood, or even on a treadmill at the gym. There’s no running experience necessary and you’ve got 39 days to complete the course! Do it while walking your Tripawd or working out. Do it to keep the pawliday pounds off and stay fit. Just DO IT! Won’t you join Team Tripawds? Sign up and get your friends to sign up too! 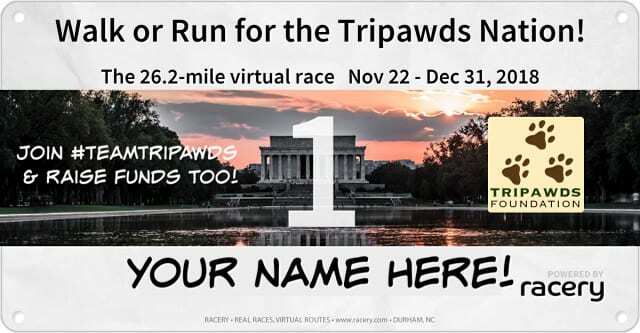 The race entry fee is only $20 and $10 of every entry will go directly to Tripawds Foundation, so you’re already helping out just by joining the team! Once you join the team and start walking or running, you will be provided a link to share with your friends and family to help raise more funds to sponsor your participation. 100% of any funds you raise through Racery during this event will help Tripawds everywhere! Come on, you know you want to do it. Be a Team Tripawds member, please sign up today. Three’s the Magic Number to Help Tripawds Everywhere!